India States and Union Territories make up India. 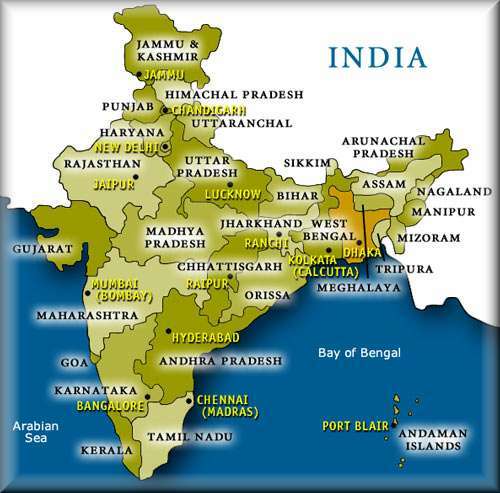 Twenty-eight India States and seven Union Territories make up the country of India. Similar to countries like the United States, India is broken into states, but what's different is that India is also broken into seven union territories. So what is the difference between a state and a union territory you ask? The difference in in the powers of a state versus a union territory, in respect to the Constitution of India. Article 73 of the constitution says that "the power of a Union shall extend to the matters with respect to which Parliament has power to make laws". In other words, the Federal Government has full say over laws which govern all lands in India's union territories. Article 162 of the constitution says that "the executive power of a State shall extend to the matters with respect to which the legislature of a State has power to make laws". Meaning, a State is granted more independent freedom to make laws that govern its respective territory. Andhra Pradesh, Arunachal Pradesh, Assam, Bihar, Chhattisgarh, goa,Gujarat, Haryana, Himachal Pradesh, Jammu and Kashmir, Jharkhand,Karnataka, Kerala, Madhya Pradesh, Maharashtra, Manipur,Meghalaya, Mizoram, Nagaland, Orissa, Punjab, Rajasthan, SikkimTamil Nadu, Tripura, Uttar Pradesh, Uttarakhand, and West Bengal. Andaman and Nicobar Islands, Chandigarh, Dadra and Nagar Haveli, Daman and Diu, Lakshadweep, National Capital Territory and Pondicherry. Now you may be curious as to why the division of power between states and unions worked out this way in India. For this answer we must look at a number of factors. First, India has been ruled by many different ethnic groups through time, and each ruler has left a mark on the societies that they had ruled; this can be noted throughout India's history. The most famous of India's occupational rulers was the British. The British saw that the various regions of India were either ruled directly by the British or by local Rajas (Princes). In 1947, India gained its independence, and these land divisions were mostly preserved. As time went on, the Indian Administrators and Parliament brought many of the princely states into the union and helped Indian people redefine themselves in these newly defined land regions. Many India states became unstable because the way that the British split up India's regions did not make sense for the people of India. As tensions rose, Parliament reorganized the country along linguistic and ethnic boundaries into states and union territories; this is known as the States Reorganization Act of 1956. Former Portuguese and French Colonies were brought into the republic as the union territories of Puducherry and Nagar Haveli, Goa, Daman and Diu in 1962. New territories and states have been created out of existing states too. Bombay State was split into the states of Gujarat and Majarashtra in 1960, Nagaland became a state in 1963, Punjab was divided in 1966, which created Haryana. The northern region was transformed into Himachal Pradesh, and Chandigarh was made a Union Territory. Declarations of states were carried out for Himachal Pradesh in 1971, Manipur, Meghalaya, and Tripura in 1972, and the Kingdom of Sikhism joined in 1975. In 1987, Arunachal Pradesh, Mizoram and Goa became states, but Goa's northern exclaves Daman and Diu became part of the Union Territories. In 2000, three new states emerged. Chhattisgarh came from Eastern Pradesh, Uttarandras (Uttarakhand) was made from the hilly regions of the Northwest Uttar Pradesh, and Jharkhand came from the Southern Bikar districts. Union Territories of Dehli and Pudcherry have later been given rights to elect their own legislature and are considered small India States. Leave India States to check out popular India tourism destinations! Check ut a physical map of India.